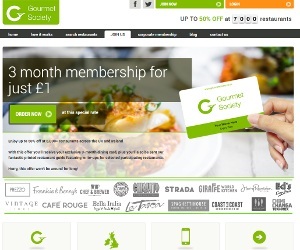 The gourmet Society offer huge discounts across a range of leading restaurants in the UK ranging from local family favourites to National chains to michelin star standard eateries. The perfect place to get the best deals on family meals out or dinner dates with the other half. Why not sign up and become a member so you can take full advantage of their fantastic deals which include; 50% off food bill, 2 for 1 meals or 25% off the total bill including drinks. They cover a range of restaurants offering all different types of cuisine which include the family favourite; Frankie and Benny's, Coast-to-Coast, Bella Italia, Marco Pierre White's and Malmaison. You can find their full list of restaurants on their website at www.gourmetsociety.com or download the app on app-store. Be sure to keep up to date with VoucherSaver.co.uk for all the latest offers.